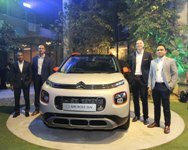 Kuala Lumpur, 24 April 2019 – Naza Euro Motors Sdn Bhd, the official distributor of the Citroën cars in Malaysia announced the arrival of its new-generation SUV, the all-new Citroën C3 Aircross SUV last night in the presence of Maxime Simoncini, Groupe PSA area manager, South East Asia, R. Devaraju, deputy group CEO, Automotive Group, Naza Corporation Holdings Sdn Bhd, Yasser Awan, CEO, Naza Euro Motors Sdn. Bhd. and Khairul SM Sharifuddin, head of marketing & communications, Naza Euro Motors Sdn. Bhd. Bukit Jelutong, 18 February 2019 – AONE Logistics Sdn. Bhd., a trucking and haulage company, purchased additional units to facilitate the expansion of its trucking and haulage requirements. The deal involves a total of 15 Scania G-Series trucks, nine G360LA4x2MNA, five G410LA6x2MSZ and one G460LA6x2MSZ . Shah Alam, 28 January 2019 – The new Hino 700 series, SR1E 6×2 prime mover was launched today by Ken Iwamoto, managing director, Hino Motor Sales Malaysia (HMSM), in the presence of Billy Ng Seng Kong, chairman, HMSM, Dr Iqbal Muhammad Sharom, CEO, MBM Resources Bhd, Ichiro Hisada, senior managing officer, Hino Motors Ltd Japan, invited quests and dealers.